The garden has been ‘difficult’ this year with the excess of rain and cold temperature. Some things like the rhubarb, strawberries, carrots and parsnips are all doing great but things like radishes, mizuna, spinach and rocket just haven’t been any where near as good as last year. Because the weather had been so bad we turned our conservatory into a bit of a greenhouse to try and give us the outdoor feeling, even when it’s inclement outside, and it’s fair to say that the tomatoes indoors are well ahead of the ones outside. 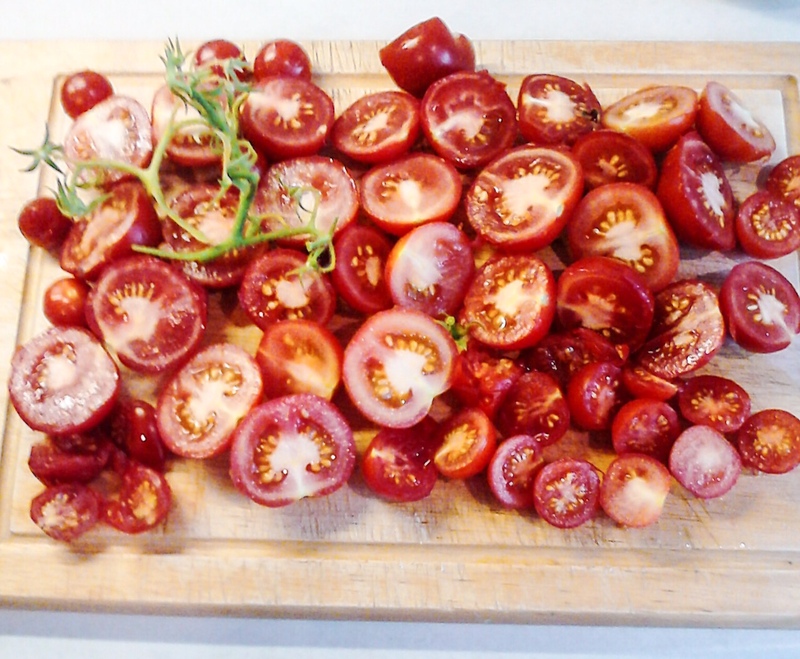 Science was delighted to harvest 2lb of tomatoes from the conservatory which he then slow roasted and turned in to a lovely pasta sauce using garlic and herbs from the garden. We’ve got our first egg!!!! I do this with our tomatoes from the greenhouse – it’s lovely.